Orbiting between Mars and Jupiter, asteroid (7635) Carolinesmith honours Dr Caroline Smith, the Museum’s Head of Earth Science Collections and Principal Curator of Meteorites. ’I feel really privileged to have an asteroid named after me, it was a complete surprise as I had no idea it was going to happen,’ says Caroline. The asteroid was discovered on 6 November 1983 by A. Mrkos, but has only recently been officially named. To be named, asteroids must go through a rigorous selection process governed by the International Astronomical Union (IA U). When an asteroid is first discovered, it is given a provisional name, formed from the year and then a letter denoting the half-month period within which it was found. Once its orbit has been confirmed the asteroid can be named formally and given a number that corresponds to the order in which it was discovered. There are further guidelines around exactly what it can be called - not to mention the name must also be submitted for approval by a 15-person committee. 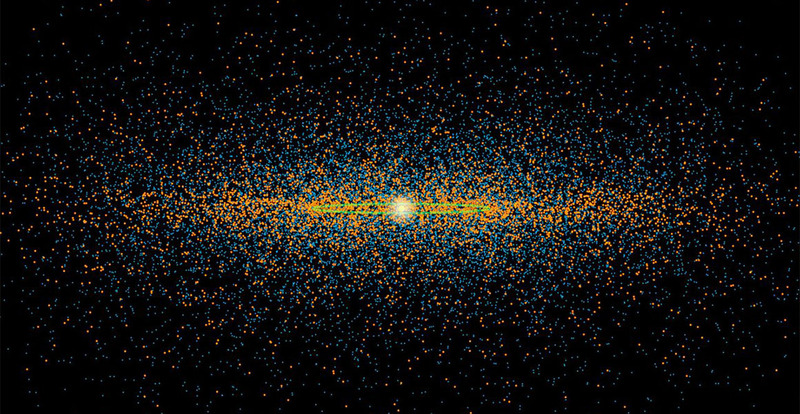 So while there are over 200,000 asteroids that have been given provisional numbers, fewer than 20,000 have been named. Asteroid (7635) Carolinesmith is in esteemed company: other names include (4147) Lennon, (2985) Shakespeare, (4547) Rembrandt, (1991) Darwin and (2001) Einstein. Caroline says, ’Not only is this a personal honour, I also think it reflects the amazing work we do here at the Museum. Our scientists study samples from our world-class meteorite collection to better understand the formation and evolution of our solar system and the various objects in it - asteroids, the Moon and Mars. Caroline is not the only person at the Museum to have an asteroid named after them. In 2005, the Museum’s Merit Researcher Professor Sara Russell, who studies the formation of the solar system and the evolution of our Moon, was also given the honour with (5497) Sararussell. ’I was at first worried in case it might impact the Earth,’ says Sara. ’But it turns out it has a nearly circular orbit about three times further out from the Sun than Earth, so there is no chance of getting famous for all the wrong reasons. ’My asteroid is 20 kilometres across and is a C-type asteroid. That’s my favourite type as they are thought to be the parents of carbonaceous chondrites, the type of meteorite I like to study on Earth.